This is a guest post by Sue Black, computer scientist, academic and social entrepreneur. She was the founding chair of the British Computer Society specialist group BCSWomen and is the founder of social enterprise #techmums. My mum died when I was 12. I left home and school at 16, married at 20, had three kids by 23 and got divorced at 25 after my ex-husband became violent. Me and the kids ended up in a women’s refuge for six months. At 26 I found myself on a council estate in Brixton wondering how on earth I was going to give the kids the start in life that they deserved. We were living on benefits. I had no family to turn to, no high earning career to go back to, no savings, no money, nothing. I decided that education was the answer. I’d loved Maths at school, left with five O-Levels and worked in accounts before my maternity leave; I wouldn’t have been far above minimum wage if I’d gone straight back to work. I couldn’t have made enough money to feed a family of four plus pay for childcare. I went along to the local college and talked to them about studying there. The teacher told me about the fast-track course they ran: the equivalent of two A-Levels in Maths in a year, only six hours a week in the classroom and 20 hours a week of study at home. It sounded perfect. I walked into the first class. I was 26, had dyed black bushy, curly hair, wearing black DMs, a red mini skirt, black leggings and a black leather biker jacket. Nearly everyone else in the classroom was a white male in a suit. I pretended to be confident while, inside, feeling like I was almost having heart failure. It actually turned out to be a great year of becoming a slightly more confident person, realising that I wasn’t just a mum – I was smart and loved Maths too. I applied to study computing at South Bank University, and was accepted. There were 83 of us in my class, just eight women and 75 men, most of them 18 years old. I was the third oldest in the class. It was tough to start with, but after four years I made it through: I got a 2:1, then a PhD position and started teaching part time. Finally I had enough money to feed and clothe my family. It was a great feeling. I’ve now had a successful 20 year career in computing. Sadly, I’m in a minority as a woman in tech, but my experience has made me passionate about supporting and encouraging other women in the industry and into the industry. Although there are currently some high-profile women heading up computer companies and startups – Marissa Mayer, Jacqueline de Rojas and Alex Depledge – they only represent around 1% of all Chief Executives in tech. This problem starts early on, as only 17% of computer science students are female. The reasons for this are varied and sometimes complex, including stereotypes of the ‘computer geek’, a tendency in schools to push boys rather than girls towards science, tech, engineering and maths (STEM) subjects and a feeling that women don’t ‘fit in’ when it comes to overwhelmingly male tech start-ups. It’s also about the lack of female role models showing women they can have confidence in their own ability. I decided to use my own experience to do something about this. I now run #techmums, a social enterprise that teaches tech skills to mums in disadvantaged areas. I want to empower women – particularly those who had been out of the workplace for a while – and their families and communities through technology. We aim to take the mystery out of technology, showing mums how to use social media and keep their kids safe online. We also teach skills like web and app design and coding, offering them a window into the opportunities the tech world provides and bridging the growing knowledge gap between them and their kids. 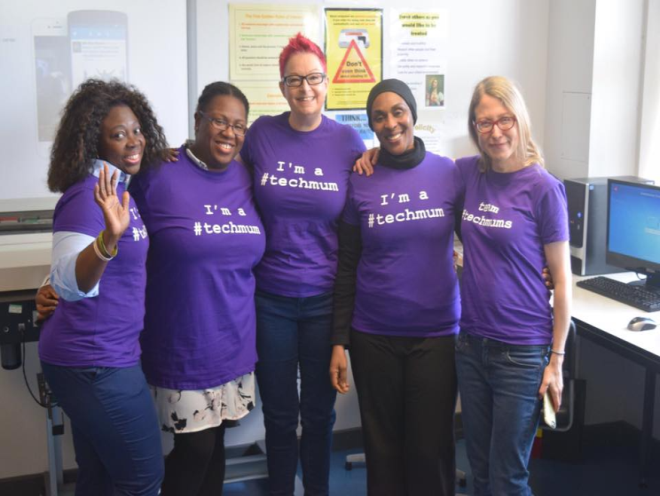 Our mums go on to get jobs, go back into education and improve their work and home lives during the #techmums programme. One of our recent graduates Lisa signed up to do a Maths GCSE and afterwards got a job. She said “#techmums changed my life. It made me realise that I’m not just a mum”. There is no better feeling in the world than seeing that you have helped create positive change in someone’s life. Helping women to see what they can achieve and seeing so many get the tech ‘bug’ makes all of my personal struggles worthwhile. That is why it is so important to have Ada Lovelace Day – to remember the huge contributions made by Ada herself, the first computer programmer, Grace Hopper, and countless other women. But it’s sad to think how many potentially revolutionary ideas are being lost due to the lack of diversity in computing. A recent study has shown the huge difference that women make in the workforce, increasing vital qualities like team confidence and group experimentation. When it comes to innovation, technology needs women as much as women need technology. Photograph courtesy of Sue Black. 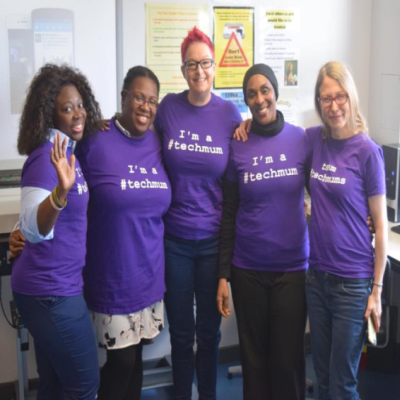 Image of five women with their arms around each other, smiling and wearing t-shirts that say “I’m a #techmum”.